Special featuresAnalog Chronograph, Analog armani Chronograph, Analog armani gold Chronograph, Analog armani gold Silver Chronograph. Watch Information. Band ColorGold. 2 YEARS MANUFACTURER WARRANTY. Round polished stainless case, steel top ring with mirror border, polished stainless steel case legs. Light silver dial with 12 Swarovski crystals. Stainless steel hour, minute & second hands. Self-adjustable strap. It is this diversity of style and design that have made Lacoste watches so popular amongst both sports enthusiasts and fashion lovers. LADIES WATCHES. POCKET WATCH. Gender: Ladies. Warranty Period: 2 Years Manufacturer. In every way, a stunning tribute to the singular vision of a pioneer in technology and design. Swiss Made. Automatic calibre. Rapid date correction. RRP: £6100. Dial: Silver & Grey dial with running seconds sub dial at 6 o'clock, chronograph hour at 3 o'clock & chronograph minute at 9 o'clock & date window at 6 o'clock. Tissot T-Touch T0134204420100. Model: T0134204420100. Bracelet Color: Silver. Dial Color: Black. Hands: Luminous. Crown: Non Screw Down. Case Thickness: 14.6mm. Case Size: 43.6mm. Lacoste Watches. Supplied With Official Lacoste Box. White Rubber Strap. Stainless Steel Case. Case Width: 38mm. Case Depth: 9mm. During busy seasons it may take a little longer. Guess Jewellery. 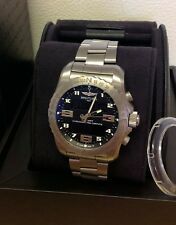 Breitling Aerospace Titanium - E79362. Model Reference E79362. This Breitling is in excellent condition complete with xupes presentation box. Circa 2000's. Our Xupes reference is W5450 should you need to quote this. Round titanium case polished. Face dark grey with crystals only 12 and 6 show. Xupes Reference W5309. Our Xupes reference is W5309 should you need to quote this. Hublot Classic Fusion Titanium - 521. Manufacturer Hublot. This second hand Hublot watch has been fully inspected in house. Display: Stunning white dial studded WITH glittering stones. SEASON'S SALE: Normal Price:- £25 - PRICE NOW REDUCED TO:- £20. MODEL : ECO DRIVE. BECAUSE IT'S VERY EASY FOR THE CROWN AND STEM TO BRAKE IF YOU ARE NOT DOING IT GENTLY. CROWN : Pull Out. CRYSTAL : SAPPHIRE CRYSTAL CLEAR GLASS VERY GOOD CONDITION. The photos give a really good sense of the style and condition of this watch. This model features a lacquered white dial with a seconds sub-dial at 9 o’clock and a 12-hour and 60-minute chronograph recorder on the sub-dial at 3 o’clock. There is a central chronograph seconds hand and a date window at the 6 o’clock position. 41mm stainless steel case with black baton dial. Size – 41mm Case. Box and Authenticity Card. Reference Number – 942197952001. Fixed stainless steel bezel. Dial Type: Analog. Date display at the 6 o'clock position. Scratch resistant mineral crystal. Pull / push crown. Solid case back. Case thickness: 8 mm. Round case shape. Model: DZ4290. Hands: Luminous. Markers: Luminous. Dial Color: Grey. Bezel: Fixed. Crown: Non Screw Down. Case Back: Stainless Steel. Case Thickness: 14mm. Part Number 233XLTTN. Watch ModelSkagen Grenen. Strap TypeStainless Steel. Age GroupAdult. Face ColourBlue. Watch ShapeRound. Instruction Manual with Full 2 Year Warranty Information. Year of Manufacture2010-Now. Tissot T-Touch Expert T0134204720200. Model: T0134204720200. Series: T-Touch Expert. Case Material: Titanium. Case Size: 43.5mm. Case Thickness: 14.5mm. Case Back: Titanium. Dial Color: Black. Fixed titanium bezel. 24 hour markings. Minute markers around an inner ring. Dial Type: Analog. Date display at the 6 o'clock position. Scratch resistant mineral crystal. Push // pull clasp. Solid case back. Water resistant 30m. - Watch Gift Sets. Watch Gift Sets. Kilimanjaro Collection. Diamond Earrings. Diamond Bracelets. How long will my order take to arrive?. Diamond Pendants. Zippo Lighters. Gents Seiko Solar Dress Watch. RRP £139.00 Our Price £99.95. As the inventor of the quartz watch in 1969, Seiko has led the watch industry for four decades in refining quartz technology for each new generation. A pure classic in great Carrera tradition. RRP: £3150. Dial: Black with GMT sub dial at 6 o'clock & grande date window at 12 o'clock. This watch features. Part Number AR1737. A matching black leather strap completes the look. ModelEmporio Armani Classic. Clasp TypeStrap buckle. User Manual with 2 year warranty information. FeaturesBlack Tone Hands. Strap TypeTwo-Piece Strap. We do thoroughly inspect watches for defects before they are dispatched, however if upon receipt. (Item model number: SKW6237. Model number: SKW6237. Part Number: SKW6237. 40 mm) in polished finishing - 5 ATM water pressure resistance construction. Dark brown genuine leather strap - Buckle. Dial Window Material Type﻿: Mineral. (40 mm) in polished finishing - 5 ATM water pressure resistance. 35 mm Case height: approx. Ceramic Gehäuse. White ceramic bracelet. (40 mm) in matte and polished finishing - 5 ATM water pressure resistance construction. (Item model number: SKW6007. Model number: SKW6007. Part Number: SKW6007. 40 mm) in matte and polished finishing - 5 ATM water pressure resistance construction. Dial Window Material Type﻿: Mineral. Boxed-product Weight: 159 g.
The silhouette of the Grenen Leather Watch echoes the curving shoreline of Skagen's Grenen beach. With its cleanly contoured supple leather strap, this is a relaxed style that's refined enough for the office. (Item model number: SKW6078. Model number: SKW6078. Part Number: SKW6078. 40 mm) in matte finishing - 5 ATM water pressure resistance construction. Dial Window Material Type﻿: Mineral. Boxed-product Weight: 141 g.
Item model number: SNE363P1. Model number: SNE363P1. Part Number: SNE363P1. Display Type﻿: Analogue Classic. Band Material: Stainless Steel. Band Length: standard length. Bezel Material: Stainless Steel. Boccia Watches - Creative Watch Designs in Pure Titanium. Boccia Watches And Jewellery Are Manufactured To The Highest Standards Using Their Own Independent Production Plants. Titanium Is 30% Stronger And 50% Lighter Than Steel And Is Renowned For Its Durability And Therefore Very Slim Designs Can Be Constructed. Strap changing tool. Case Material: Titanium. Crystal Material: Mineral. Dial Colour: anthracite. Suitable watch weight, luxurious silver / black stainless steel watch band, all this make this watch super elegant and comfortable to wear. 1 Watch Remover. 1 Luxurious leather paper watch box. Classic watches: stainless steel durable fashion.